The Minnkota Chevy Bolt has been having a lot of fun this summer at parades, county fairs, picnics and other community events, but this week it switched roles from pageant queen to power crew. Minnkota power system operator Terry Peoples was joined by Kevin Kennelly and Mike Bedney of System Operations for a day trip out to Lerfald substation near Larimore, N.D., and a quick jaunt to the Prairie 345/230-kV yard. Since the team only had a light load of equipment to haul, they grabbed the opportunity to take the EV for a test drive. 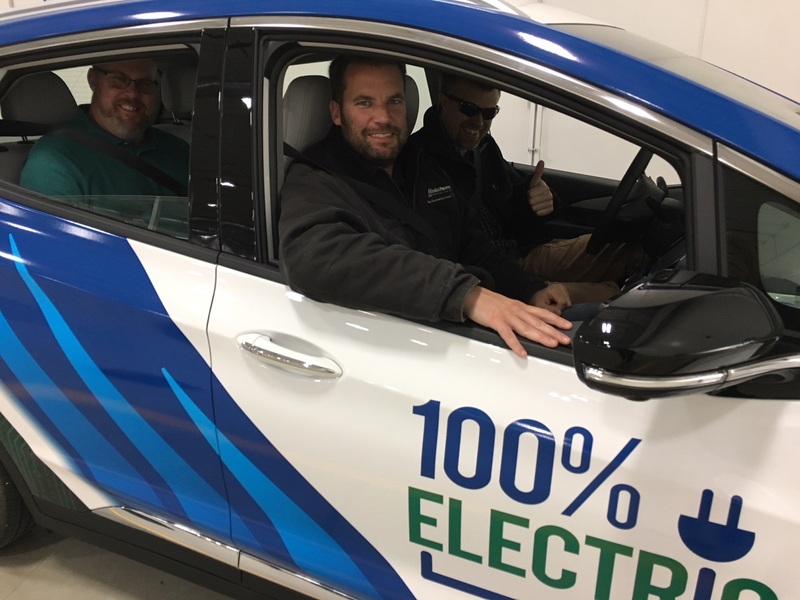 After a quick training session, the trio from System Operations buckled in for a day of driving all-electric. Pictured from left: Mike Bedney, power system operator trainee; Kevin Kennelly, system operations training administrator; and Terry Peoples, power system operator. All three men are over 6 feet tall, so it took a little creative seat adjusting to get comfortable in the little car. But once they hit the road, their perceptions shifted; they were impressed. "It was more similar to a regular car than I thought it would be," Kennelly said. 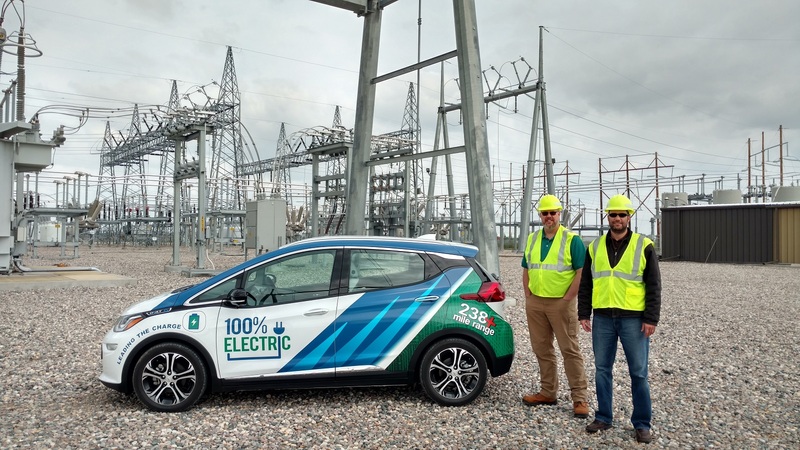 Bedney and Kennelly stop for a quick photo with the Bolt at Minnkota's Prairie Substation in Grand Forks. Kennelly and Peoples, who both took a turn behind the wheel, agreed that the car's acceleration was remarkable. They even flipped it into "sport" mode for some extra gusto. Among their other favorite features of the car were the dynamic regenerative braking (allowing them to generate kW as they drove downhill) and the steering wheel vibration feature that alerts the driver if the vehicle begins to cross the center line or shoulder. The EV testers even started to get a feel for the most efficient ways to conserve battery power. "It seems like using cruise control gave the best performance as far as kW per mile," Kennelly explained. "I’ve been considering buying an all-electric car in the next few years," Peoples said upon his return. "So I enjoyed getting behind the wheel of a more affordable car than the Tesla Model S cars I’ve driven recently in Minneapolis." While in western Grand Forks County, the crew stopped by Larimore Dam and found a perfect place for the Bolt. 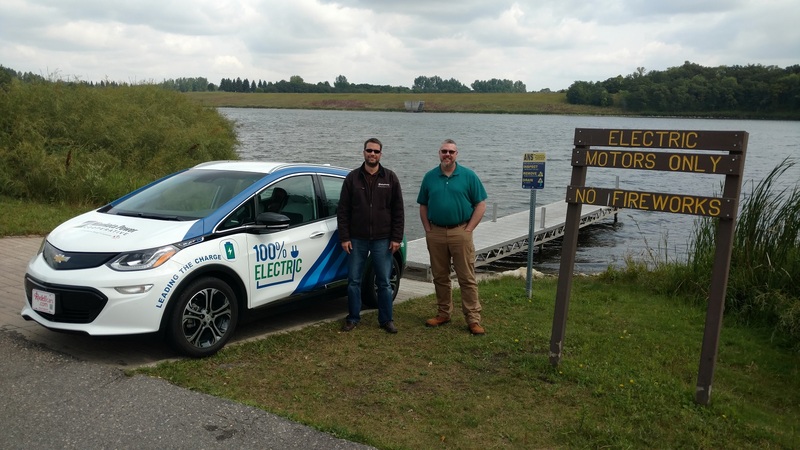 "We noticed that electric motors are allowed, so we were going to take advantage of that," Kennelly joked, "but we couldn’t figure out how to get the vehicle to float." Peoples did note that he would like to see GPS navigation included in the car, especially to point the driver to nearby charging stations (a feature touted by Tesla models). However, the Bolt does come equipped to project your Android or Apple smartphone navigation system. It sounds like this won't be a one-and-done trip. The power system team hopes to have the Bolt on another journey soon!